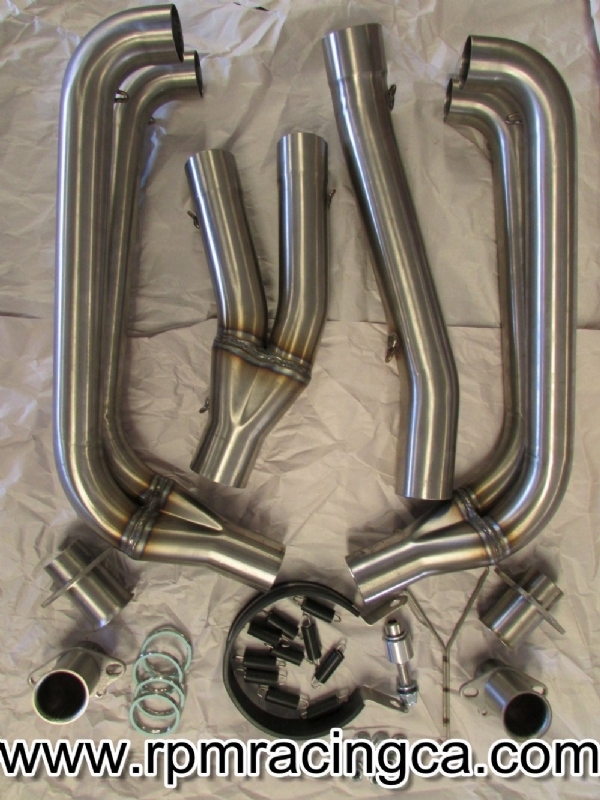 The RPM ultra lightweight stainless steel exhaust system has arrived. This is a 4-2-1 style system that allows the use of all of the stock options such as the chin fairing, center stand and allows access to the oil pan drain plug for easy oil changes. The RPM ultra lightweight exhaust is offered with four different muffler options including round or megaphone. The round muffler options are stainless steel, Titanium or carbon fiber. The megaphone comes in polished stainless steel only. The system is lightweight with the heaviest system coming in at 9.9 lbs. The O.E. exhaust system weighs 31.6 lbs, which results in a weight savings of at least 21.7 lbs. The oil drain plug can still be accessed to ease of draining, the center stand can remain and the system tucks up nicely into the lower chin fairing. The base system is the stainless steel round muffler and the other mufflers are available at an additional cost. You must select the year model of your bike and the muffler kit you require. The kit includes new header gaskets, lock nuts and all of the mounting hardware required as well as the spring tool.